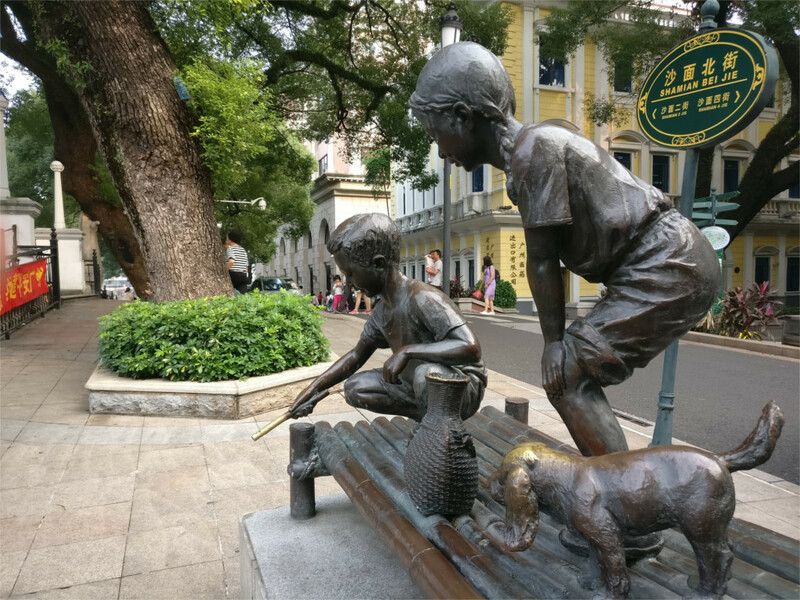 We walked down Qingping Road and came to the wide and very busy inner ring road. Past the sea of cars, straight ahead would be Shamian Island. An elevated pedestrian walkway seemed to lead straight into an equally busy flyover. Putting all our trust in the hands of town planners, we crossed the road, and found that the walkway dipped under the traffic flyover, and led straight on to the charming bridge over the narrow canal which you see in the featured photo. That is Shamian Island for you: walk blindly into the teeming brashness of modern China, and suddenly through a sideways opening in the world, you can step into an unhurried and charming little world. Charming public art is scattered around this island. I haven’t seen Cantonese boys and girls with this kind of hair. So I guess this piece harks back to the strange history of the island. The maritime silk route led to Guangzhou two thousand years back, but this island entered history only in 1685 CE, after about a hundred acrimonious and bloody years of trade with the west, when the Qing emperor allowed British merchants to settle in this mud flat on the Zhujiang. 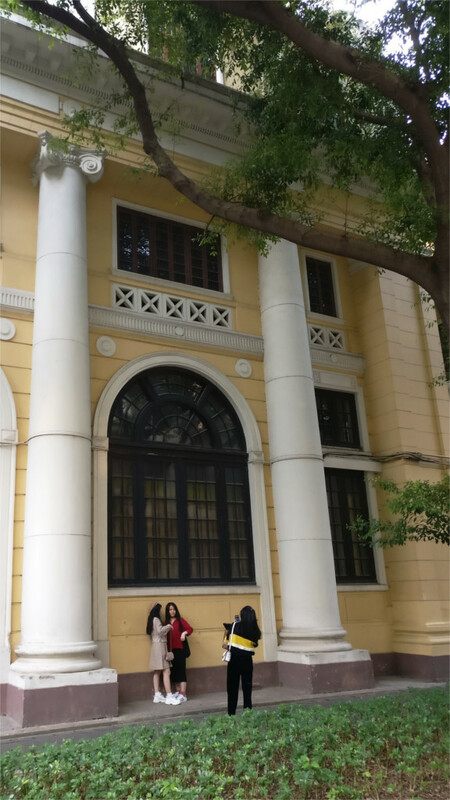 The subsequent opium trade that the British started out of this base led to the first of the Opium Wars in 1839. This was the beginning of an upheaval in Chinese politics which lasted for a hundred and fifty years, led to the Cantonese diaspora, the destruction of imperial China, and the rise of a modern nation. Now, as these statues show, the view of those early years of contact with the west has taken on a somewhat rosy hue. Shamian Island was once the exclusive preserve of the British and French. This is apparent the moment you walk across that lovely bridge. The buildings have been renovated with care, and now house government offices, museums, art businesses, and many restaurants and cafes. Much of the renovation of this district, and its conversion into a leisure area, dates from about a decade back. 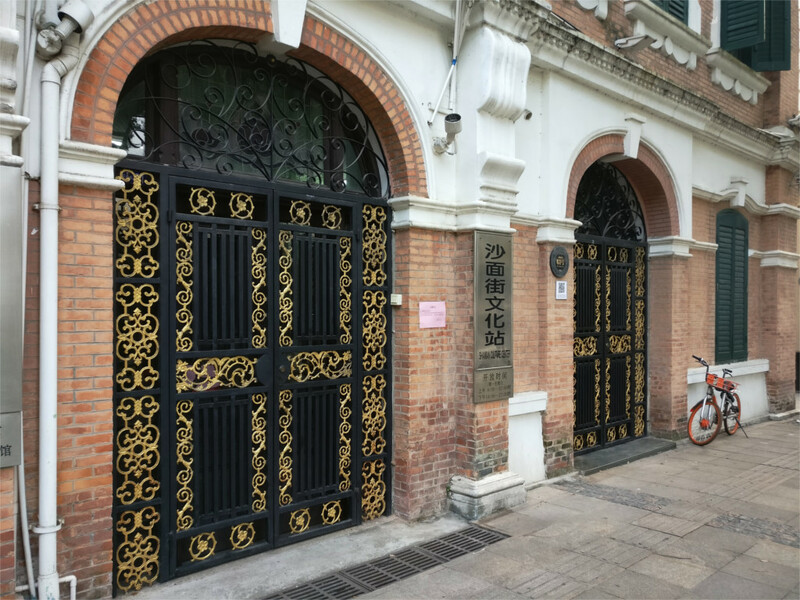 I don’t think the ornate door which you see in the photo above has much of history, but the building does. The shaded leafy roads of the island, and the massive buildings, are typical of British and French areas throughout Asia. I can recognize them as coming from the same school which churned out the buildings of Bombay, Calcutta, and Rangoon. 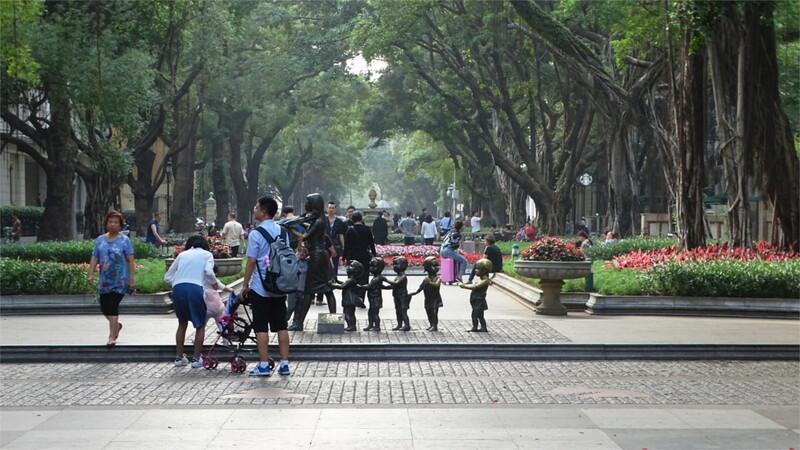 As a result, this part of historical Canton attracts many visitors from the rest of Guangzhou. A small bridge at the western end of the island permits quick access from a nearby metro station. I suppose the evening we spent in the island is more or less typical. It was full of families and young people enjoying a stroll. We’d got up before four in the morning to take an early flight into Guangzhou. Airports in China are well outside cities, even in smaller ones, so travel between the city and the airport can take significantly longer than the flight itself. Now in the evening, we were too tired to do anything but stroll down the broad leafy avenue that you see in the photo above. We found a cafe and sat there for a while, we watched people, eventually we walked down to the waterfront for a beer and watched the light fade from the sky, as the city lights came up. When we walked back across the island it had changed character. Parks and streets were lit up, and buildings were in shadows. A different set of people were here for dinner. The families and children were gone, young people were out for an evening of fun: couples and groups of friends. This gave us a good opportunity to check which were the most popular restaurants. After all, when you are in a foreign country, this is one of the easiest ways to find the best local food. You had me wondering how large this island is, so I took a look at the map – it almost looks man made but it can’t be. Fascinating history and now repurposed for modern life. Thanks for the photos and insights. It is man made, over about two centuries. I also stayed on this man-made island at the end of my trip to southern China back in 2012. 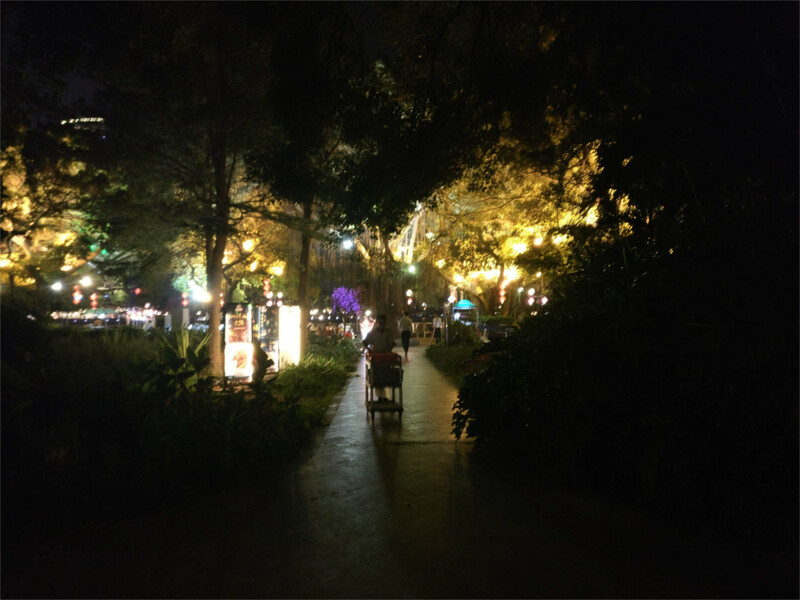 It was so peaceful and quite the contrary with the hustle of bustle of Guangzhou. After a busy week, staying here was a perfect finale to my stay in China. Yes, exactly my expectation. I stayed in Liwan, north of it: crowded, bustling and interesting. The White Swan is quite swank now. Probably has the highest priced buffet dinner that I saw in Guangzhou. I would so love to explore this!